In April 1673, James Davie was with a number of other Covenanters at a conventicle held at Black Dub (now known as Netherhouse) in order to hear Rev Archibald Riddell preach. During the service, they heard that a party of dragoons from the garrison at Mid Calder, under the command of Lieutenant Heron (or Inglis), was approaching. The Covenanters fled over a wet moss which so hampered the soldiers' horses. The dragoons, however, drew their pistols and shot across the moor in their direction. Only one person suffered in the incident- James Davie himself. A number of other Covenanters were captured by the soldiers. tradition says that the soldiers sold their clothes, Bibles and other belongings. 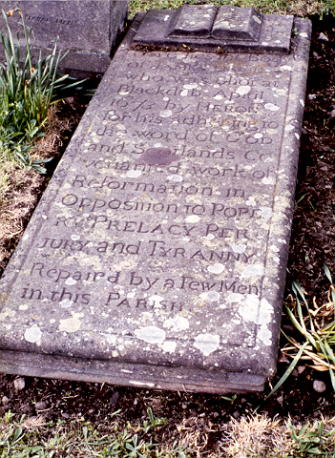 The tablestone to James Davie is located in the old cemetery in Bathgate, which is one and a half miles east of the town centre, on the road towards Edinburgh. The stone is located south of the church and measures seven feet by three feet.